Brought up in a musical household in Miami, Kenny Grohowski has been performing since the age of 14. His rich musical background is demonstrated through the growing list of his collaborators and guest artists, including John Zorn, Andy Milne & Dapp Theory, Felix Pastorius & The Hipster Assassins, Shanir Blumenkranz, Trey Spruance & Secret Chiefs 3, Imperial Triumphant, Rez Abbasi & Junction, Jorge Sylvester’s A.C.E Collective, Jonathan Powell & Nu Sangha, Daniel Bernard Roumain, Bobby Sanabria, Lonnie Plaxico, Bill T. Jones, and Richie Ray & Bobby Cruz. When not working with his various affiliated ensembles, Grohowski enjoys a steady and fast paced Free lancing schedule, working with many of New York City’s top Jazz, Rock, and Brazilian artists, as well as a multitude of others, and has recorded on over 50 albums. As of 2012, Grohowski has recorded on several full length albums. At the time of this writing, Grohowski has recorded on the next full length album for Andy Milne’s Dapp Theory with Jimmy Haslip, Founding member of the Yellow Jackets as well as Allan Holdsworth new bassist, as producer. He has also recorded on Shanir Blumenkranz’s upcoming album, ABRAXAS, featuring the music of John Zorn. Also in session after a successful Kickstarter campaign, Grohowski will be recording a brand new full length album for Violin-Metaller’s Resolution 15. Coming out later in the year, Progressive Metal act Hung will be releasing their first full length album through The End Records on May 8th, 2012, as well as a brand new double CD for prolific composer Jorge Sylvester and his Afro-Caribbean Experimental Collective, both of which prominently feature Grohowki’s versatility and technique. Grohowski has become an affiliated member of Felix Pastorius’ Group, The Hipster Assassins, the newly inducted bass player of the yellow jackets and son of legendary bassist Jaco Pastorius. Grohowski has also become a touring member of Trey Spruance’s (of the Mr Bungle/Faith No More fame) Secret Chiefs 3, having appeared all over Europe in 2012 with the group. 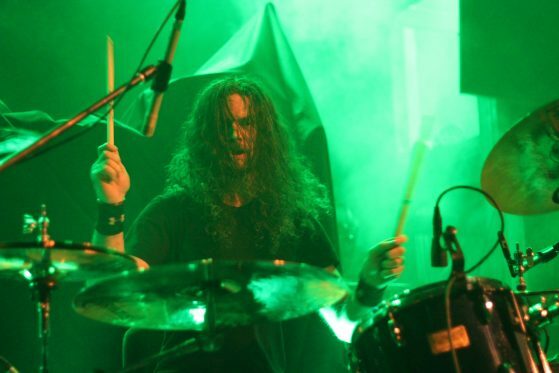 To add to his growing list of musical collaborators, Grohowski has also become the full time drummer for New York Avant Metaller’s, Imperial Triumphant.